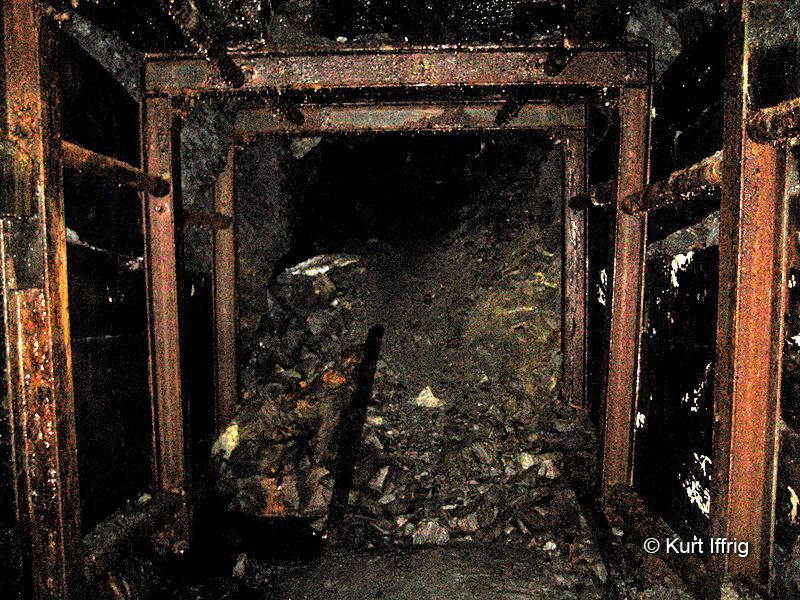 This tunnel is about a mile from the main mine. It has about one foot of water and is heavily shored up. Years of Operation: Exact years of operation are unknown. This was likely one of 15 claims filed by the Bighorn Mining Company in 1934, but that has not been confirmed. Depth: Exact depth is unknown. At about the 500 foot mark there is a catastrophic 90% cave-in. Beyond that the tunnel continues. Whether this tunnel connects to the main mine is unknown. This tunnel has no official name that I know of, so I nicknamed it the Midway or Black Tunnel. The Midway Tunnel is part of the Big Horn family of mines. This is not the actual name of the mine, but I dubbed it with that name because of its location, about half way between the Vincent Gap and the main Big Horn Mine. The Big Horn Mining Company was known to have filed 15 claims, most of them within the main mine. This tunnel was probably number 15. 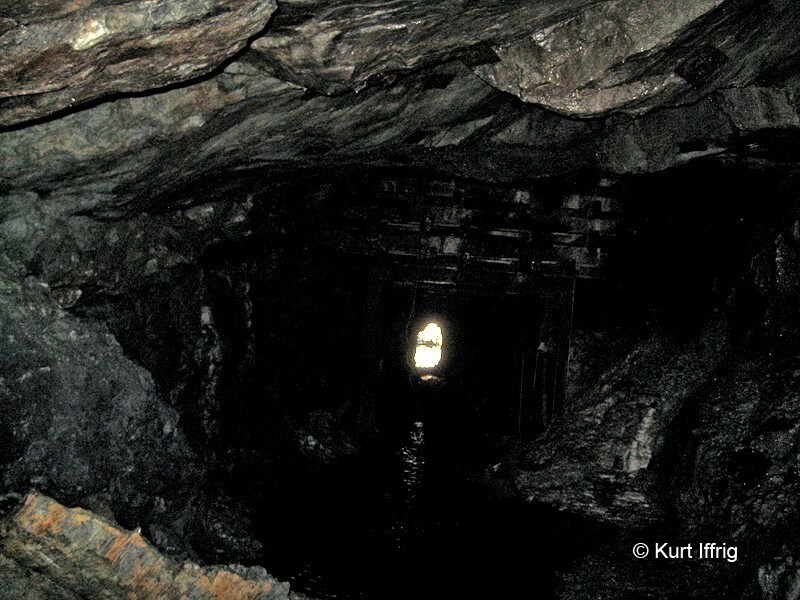 The heavy iron shoring inside indicates this was one of the later mines, and was most likely bored into the mountainside in the early 1930’s. The tunnel is heavily shored up, but the ceiling continues to fall. This 200 pound rock could go at any time. Although there is an abundance of graffiti on the outside, I saw no evidence that anyone had entered this tunnel, no trash or graffiti on the inside whatsoever. This can probably be explained by the foot or two of ice cold water, that most casual hikers are not willing to walk through. The hanging strands are not spider webs. They may actually be glow worm silk, used to trap insects. About half way into this mine I encountered some long, hanging strands that I had never seen before (see photo above). At first they appeared to be spider webs, but upon closer inspection these were much thicker, with sticky globules protruding from the threads. I took a photo and later did a little research. These may or may not be silk strands, built by glowworms, which are sometimes found in caves. Some species of glowworms do indeed live in California. These insects will hang onto the ceiling and glow, which attracts prey to their sticky silk. When moths, midges and other insects are caught, the glowworm will pull the strand up and devour its prey. This mine is supposedly also the home of bats, although I didn't see any. This mine has experienced numerous cave-ins. Above the iron supports, heavy cribbing has been added. 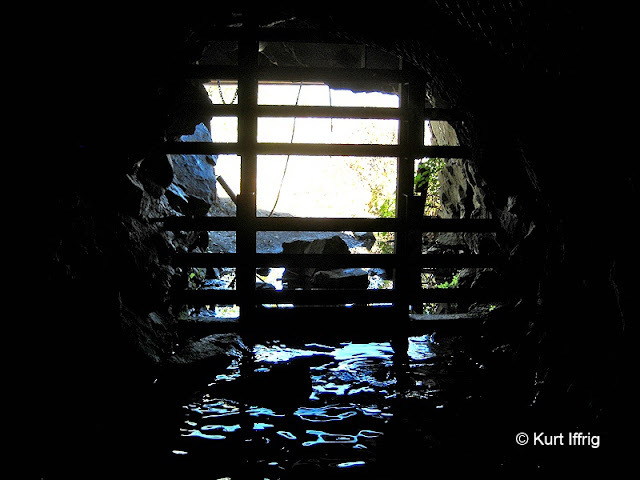 Big Horn Mine is an extensive labyrinth of tunnels. I have explored about 60% of the main one and probably only a short section of the Midway Tunnel. Although this tunnel is easily accessible and heavily shored up, I would highly recommend staying out of it. It is an extremely unstable mine. In the future I hope to add another page on the Fenner Tunnel, 1000 feet below the main mine, which is even more unstable than this one. For a more extensive history of the Big Horn family of mines please see my Big Horn Mine page. At about the 500 foot mark there has been a 90% collapse. I chose not to continue beyond this point. 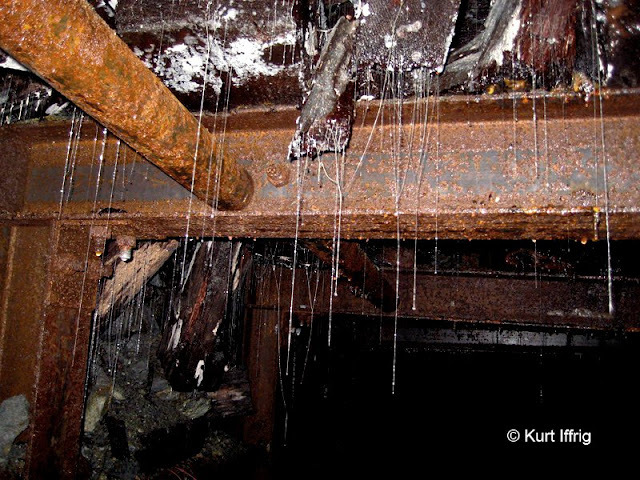 This mine has a lot of relatively modern shoring inside, probably dating back to the 1930s. In the older tunnels of Big Horn Mine I’ve seen everything from thick wooden timbers to thin logs holding up the ceiling. But the Midway tunnel is different. The shoring inside is made of thick iron beams, sometimes reinforced by heaving wooden cribbing on top. In addition, modern chain link has been attached to the ceiling to hold up the smaller debris. Because of its location I dubbed this the Midway Tunnel, but the Black Tunnel would be more descriptive. This may sound reassuring, however mines with heavy shoring have usually experienced a number of serious cave ins. Minor rockfall would have been removed by miners and they would have continued as usual. 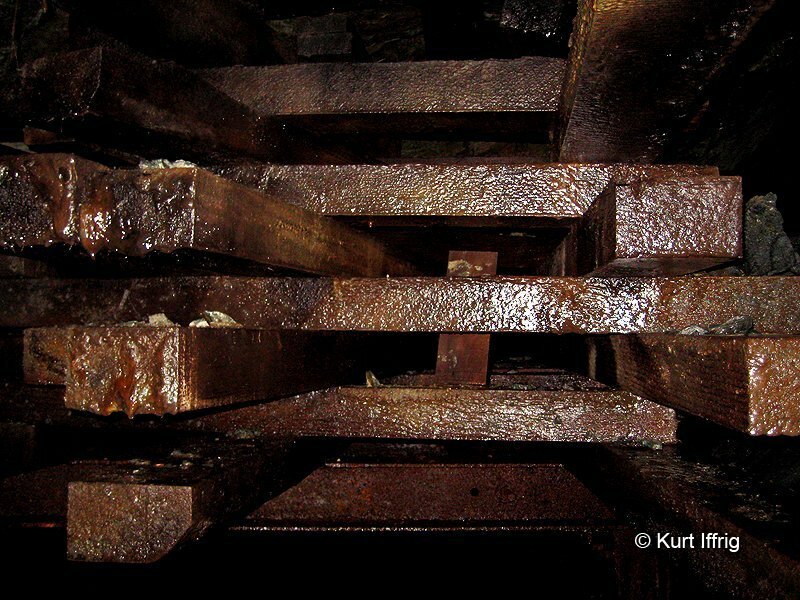 However when multiple or serious cave-ins occurred, heavy shoring would usually have been added to the problem areas. In extreme cases the tunneling would have been abandoned altogether. This was one mine I was glad to get out of. If you should find it. I would highly recommend staying out. Upon entering the Midway Tunnel (I’ve also coined it the Black Tunnel), the first thing you’ll notice is that it’s an extremely cold mine. The foot or so of water you’ll walk through is ice cold. In fact, if you were unfortunate enough to be trapped behind a cave-in, you’d likely die of hypothermia long before you ran out of air. Immediately inside you’ll see an unusual pitchfork-like artifact sticking up out of the water, something you wouldn’t want to fall on top of. I would regard the first 100 feet of this mine as safe. From there it gets progressively worse. Despite the heavy shoring, several large ceiling rocks are hanging by a thread. At about 500 feet (that’s just an estimate), there is a near total collapse. 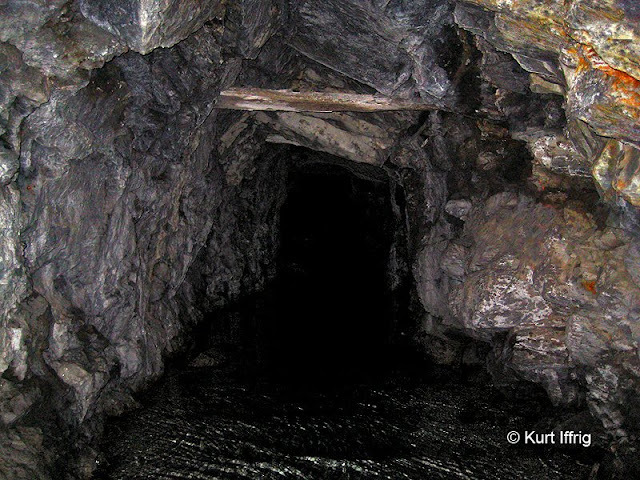 However I shined my flashlight past the cave-in and it apparently does go much deeper. I had to make a judgement call at this point, and decided not to continue on. Although the main tunnel is about one mile from this one, it is possible that the two connect. Sunrise at Inspiration Point. In the background is Mt. Baden Powell, the location of the Big Horn Mine. Inspiration Point, pictured above is one of five Inspiration Points in Los Angeles County alone. 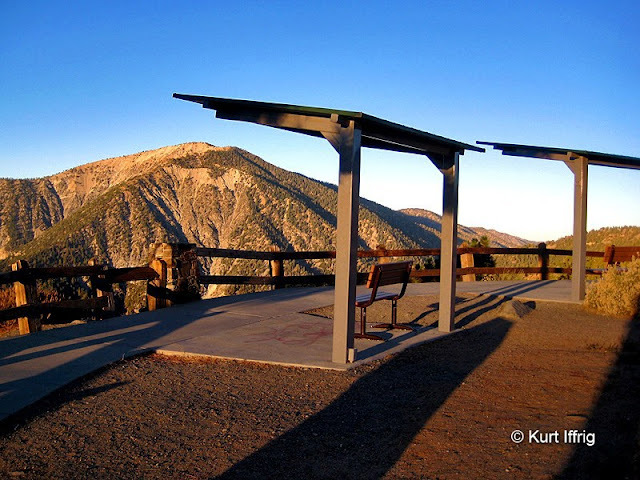 It's a small saddle on Blue Ridge, overlooking the northernmost end of the East Fork at 7,385 feet, between Wrightwood and Vincent Gap, near the eastern end of the Angeles Crest Highway. It offers spectacular views of Blue Ridge, Pine Mountain, Mt. Baldy, Iron Mountain, Pine Mountain Ridge and Mt. Baden Powell. On a clear day you can even see Santa Catalina Island, 26 miles off the shore of California. This is also where the Pacific Crest Trail, which runs all the way from Mexico to Canada crosses Highway 2. View of the Mojave Desert near Inspiration Point. There are numerous mines there I have yet to explore. Inspiration Point is also the entry point to a long dirt road called East Blue Ridge Road. It leads to two remote campgrounds (when it’s open) and allows access to an ultra remote mine called the Native Son, about 11 miles away. This is a road best suited for four wheel drives, but I plan on trying it with a two wheel drive in the future. 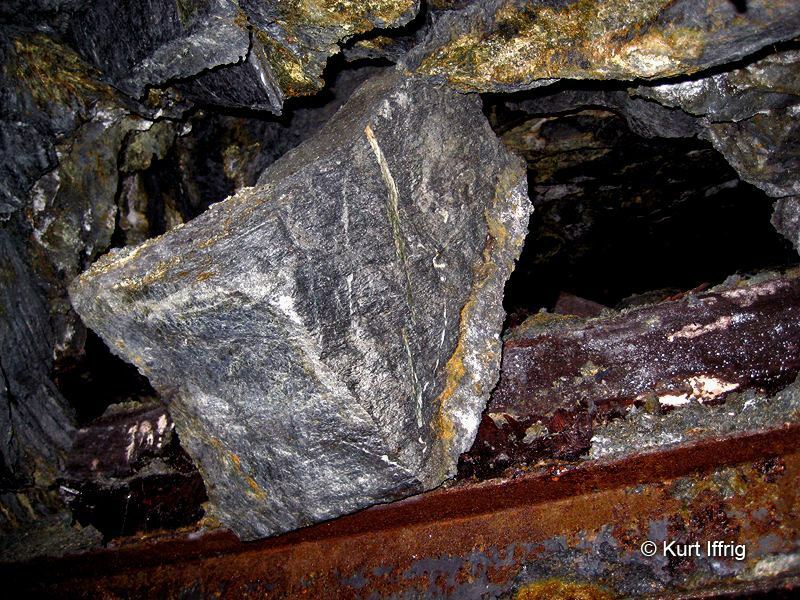 The only photos I’ve ever seen of this mine are on Hugh Blanchard’s website, taken in 2005. 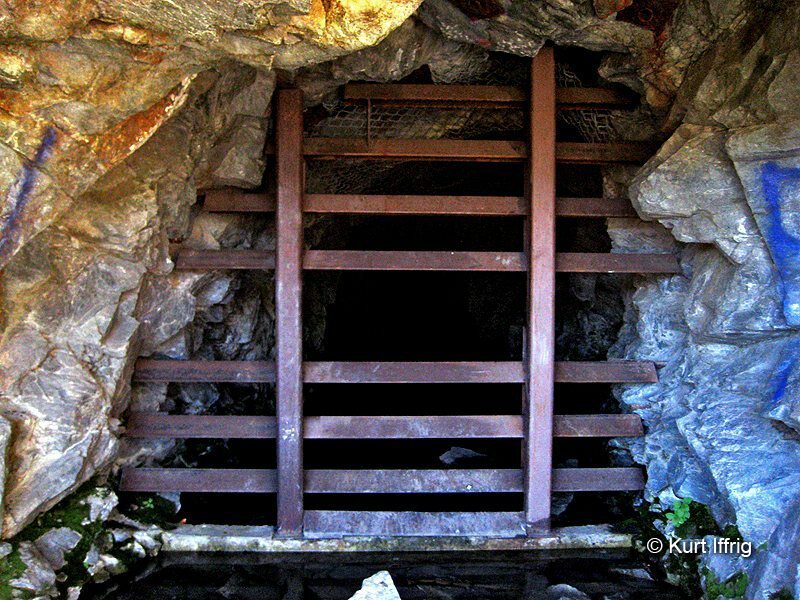 This mine contains cave pearls, stalactites and flowstone, and was worked from 1897 until 1920. Hopefully I will get to it sometime in the future. I drove this road for a short distance and found the dead coyote seen below, near the chair lifts behind Mountain High Ski Resort. 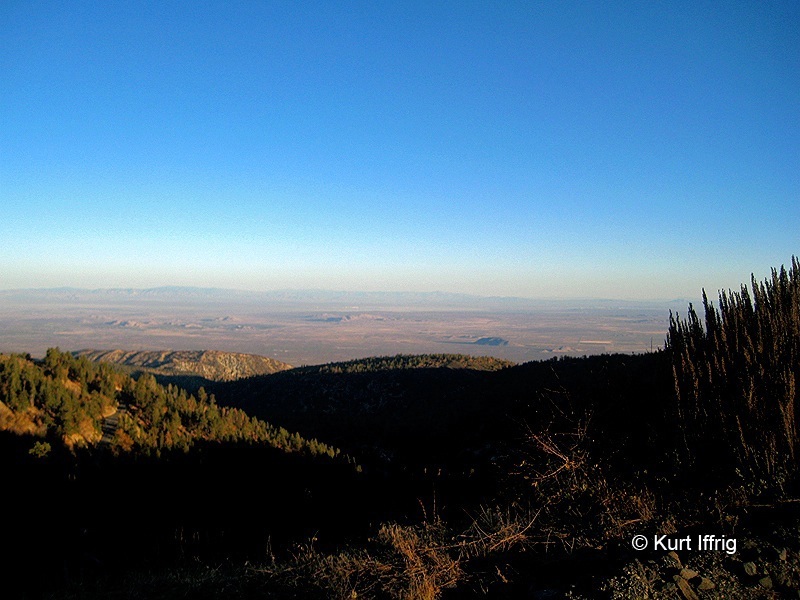 This road also has spectacular views of the Mojave Desert, seen above. 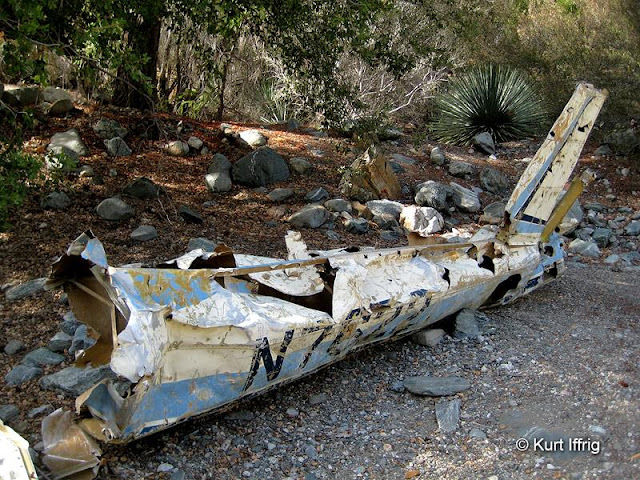 In 1974 this aluminum frame Schweizer sailplane hit a heavy downdraft and crashed in Vincent Gulch. Vincent Gulch is located far below Big Horn Mine. It leads to Mine Gulch, one of three of the northernmost branches of the East Fork, and the site of an old plane wreck, one of several in this general area. On February 6, 1974, pilot James Webb and his passenger Harry Diltiz were on a flight out of Llano, California in this lightweight aluminum framed Schweizer SGS 2-32 N7622 glider. While soaring in high winds near Mount Baden-Powell, they flew into a violent downdraft. It appears that the sailplane was trapped in the canyon and the pilot was desperately attempting a landing in the rocky wash when it hit trees on the final approach. Although the plane was completely destroyed, both the pilot and the passenger survived with only minor injuries. 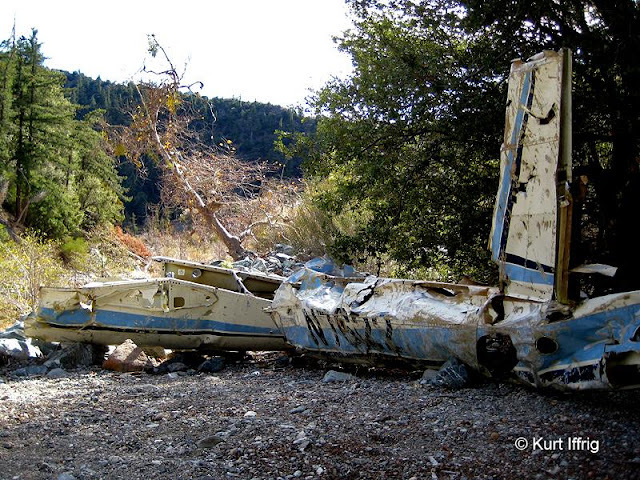 To see more photos of this plane wreck click here. While attempting to land, the plane hit trees and broke apart. The pilot and passenger both survived. As mentioned, several other planes have gone down over the years in this general area. Joe Idoni has an excellent website detailing these wrecks and many others if you are interested ... Aircraft Crash Sites. The crash mentioned above is deep into Vincent Gulch, near the junction with Mine Gulch, in an area that is frequented by bears. Vincent Gulch does have a trail, but only until it reaches a rock wash. After that the hike becomes another bushwhacking adventure. 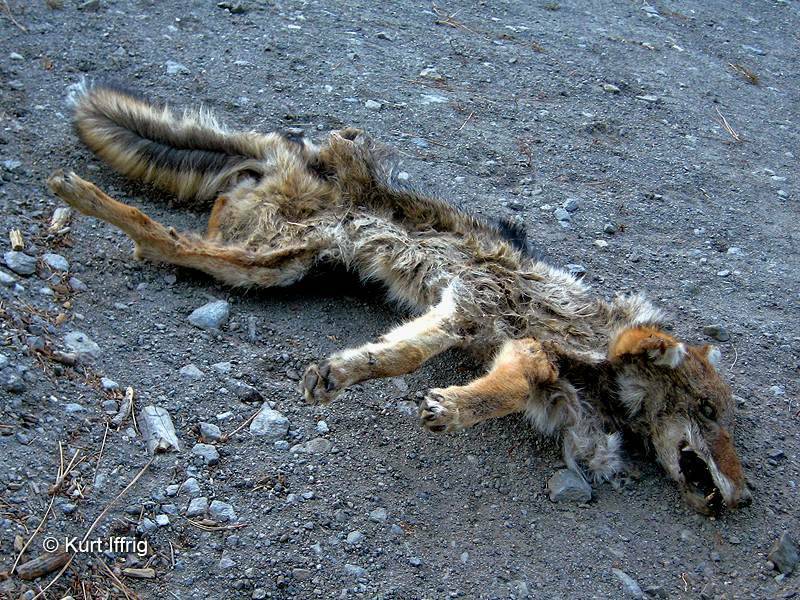 Is this the legendary Chupacabra, or just a dead coyote? I found him close to the Blue Ridge Road.